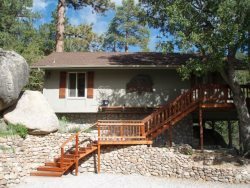 Secluded area with stunning views of the Hemet valley. Octagonal shaped house. Comfortable interior. Upstairs loft sitting area or office with a futon. Two bedrooms, master with a king and one with a queen bed. Property is located 2.7 miles from the heart of town.